Warframe is celebrating its sixth—yes, sixth!—anniversary and to celebrate, Digital Extremes is dropping a freebie into your inventory later this week. Unlike PUBG's celebratory dusty baseball cap, Warframe will be awarding its players a new and exclusive Liset Skin. There's bonus gifts for new players, too; last year's Dex Excalibur skin will be reissued, along with "all its previous anniversary gifts". 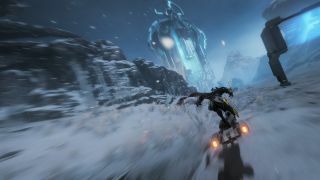 If you're wondering what's next for Digital Extreme's fan-favourite shooter, community director Rebecca Ford and creative director Steve Sinclair recently laid out an entire Warframe roadmap for 2019, confirming not just the return of the TennoCon convention, but also details of new Warframes in the works, too. Steven awarded the MMO a hearty 86 when he reviewed Warframe last year, stating that while "Warframe doesn't rub it in your face, there's a wealth of lore and story to unearth—especially once you get to more recent, ambitious story quests." Impressed by the "colorful" NPCs, he praised the game for its "a sprawling world with stories to tell, people to meet, and loot to farm."